What is MS STEP UP? The USF School of Physical Therapy and Rehabilitation Sciences (SPT&RS) offers the MS STEP UP program. MS STEP UP stands for Multiple Sclerosis Standardized Training and Education Program with University Partners. This is an advanced training program for Doctor of Physical Therapy (DPT) students, embedded within the three-year DPT program at USF. The MS STEP UP program offers “MS Scholars” didactic, clinical, research, service and advocacy experiences. In 2011, USF was selected as the second university in the US to offer this unique training program. The MS STEP UP program at USF was modeled after the original program at the University of North Carolina Chapel Hill. There are now three programs in the US (UNC, USF and University of Kansas) and it is our vision that MS STEP will spread to other DPT programs throughout the US. 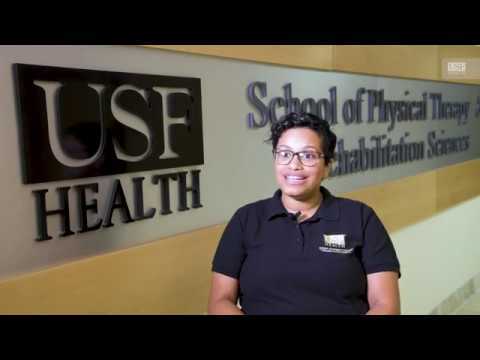 Through the MS STEP UP program, USF and the National MS Society (NMSS) seek to prepare Doctors of Physical Therapy with advanced knowledge and skill in MS rehabilitation and in the care of patients with MS within an interdisciplinary team. Multiple Sclerosis (MS) is a chronic, neurodegenerative disease that affects a person’s central nervous system (brain and/or spinal cord). Recent prevalence studies demonstrate that MS affects nearly 1 million individuals in the U.S. Symptoms may include sensory or vision changes, muscle weakness, balance and walking deficits and progressive activity limitations. No two people with MS are affected the same, making it critical that health professionals working with this population have specialized training and experience. While there is no cure, there are treatments that can alter disease progression including physical therapy. Physical therapists with advanced training in MS care can provide critical services throughout the disease course including therapeutic exercise; patient and family education; and balance, gait and functional training. In collaboration with the interdisciplinary team, these strategies can enhance quality of life for people living with MS.
Two first year USF DPT students are selected to participate in the MS STEP UP program in the spring of each year after a competitive application and interview process. The advanced training they receive enables them to develop examination and intervention skills needed to care for patients with MS. The shadowing, community service and advocacy experiences train them to work within an interdisciplinary team of MS providers. The scholarship generously provided by the NMSS provides for additional coursework, shadowing experiences, community service, travel & presentations at MS conferences, and clinical education in the MS specialty. To date, ten DPT students have matriculated through the MS STEP UP program at USF. Most have chosen to work with MS patients in neurorehabilitation settings, while others have gone on to Neurologic residency programs. A USF faculty member, Dr. Jeannie Stephenson, NMSS representatives from Florida and nationally and an entire interdisciplinary team of MS providers have worked collaboratively to develop and implement this unique program. The goal of the MS STEP UP program is to increase the numbers of physical therapists with advanced training in MS rehabilitation, to improve quality of care provided by these PTs and, ultimately, to improve quality of life for people living with MS. If you would like more information about the USF MS STEP UP program, please contact Jeannie Stephenson, PT, PhD, NCS at 813-974-5523 or jstephe1@health.usf.edu.